Sydney Sixers could continue their winning spree but will get a tough fight from Strikers who need a win. 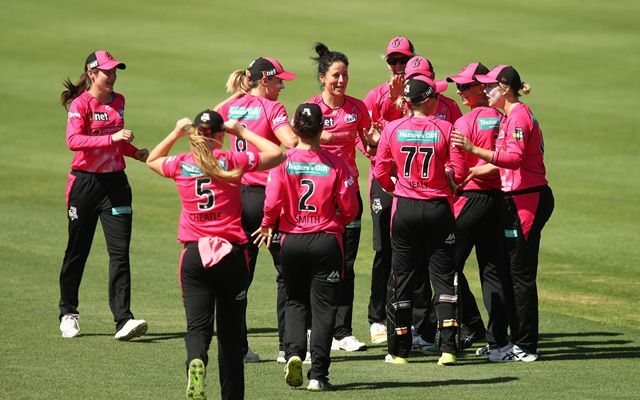 The defending champions Sydney Sixers keep their top place in the points table after the Sydney Thunder lost two close games on the weekend against the Perth Scorchers. The two losses pushed Thunder’s win-loss record to 6-3 while Sixers lost two and won seven of their nine matches. On the new-year eve, they will be part of a doubleheader at the Adelaide Oval. They will face the Strikers whom they defeated last week in the home fixture by 74 runs. This game will be important for the Strikers who have won only two of their eight matches as another game ended in a washout. The Adelaide team needs at least five more wins to finish among top four while the Sixers need one from the remaining five. Sixers have made one change to their squad from the previous match. It is Jodie Hicks who comes in for Carly Leeson. Sixers brought Hicks as an injury replacement for Clara Iemma. Strikers also made one change by bringing back Samantha Betts for of young quick, Ellie Falconer. The 38th match of the Women’s Big Bash League (WBBL) will be played between Adelaide Strikers and Sydney Sixers at the Adelaide Oval. The match starts at 1:20 PM local time (2:50 AM GMT) (8:20 AM IST). The game will be live on Sony SIX and Sony SIX HD. Streaming available on Sony Liv. The Adelaide Oval is usually a venue for the batsmen in the T20 format. However, the scores in WBBL haven’t been up to the mark. The game between Stars and Strikers last week witnessed the hosts making 171 with Sophie Devine scoring 95. A flat track is expected here for the New Year’s eve doubleheader. Ellyse Perry (C), Sarah Aley, Erin Burns, Lauren Cheatle, Ashleigh Gardner, Alyssa Healy, Marizanne Kapp, Jodie Hicks, Sara McGlashan, Hayley Silver-Holmes, Lauren Smith, Dane Van Niekerk, Tahlia Wilson. Suzie Bates (C), Sophie Devine, Megan Schutt, Tahlia McGrath, Katelyn Pope, Danielle Hazell, Sarah Coyte, Tegan McPharlin, Bridget Patterson, Alex Price, Amanda-Jade Wellington, Tabatha Saville, Samantha Betts. Alysa Healy bounced back into batting form with back to back big knocks last week. Similarly, the Sixers need one big knock from Ashleigh Gardner. She hasn’t been amongst runs over the last few months. The 15-ball 39 in the previous match would surely give her the confidence. Ellyse Perry and Sophie Devine will be main picks for multipliers due to their all-round skills but given the damage Alyssa Healy did in the previous game, it is tough to ignore them. She kept scoring runs in every game during the WWT20 in November. Suzie Bates, Ashleigh Gardner and Marizanne Kapp are too good to be considered as alternatives. Ellyse Perry, Ashleigh Gardner, Dane Van Niekerk, Alyssa Healy, Sophie Devine and Suzie Bates are part of this game with higher credits. Four of them are in the all-rounders category. A gamble must be made to pick three; the maximum allowed in this fantasy game from this category. To reduce costs, someone like Tahila McGrath can be considered. Get the latest Cricket News and updates Match Predictions, Fantasy Cricket Tips and lots more on CricTracker.com.